Many locations won’t let your vendors in the door without proof of proper insurance. We are happy to oblige, and many locations already have us on file. Our goal is to ensure YOU get what YOU want. Once booked with us you will receive a username and password in order to log on to our website where you can access your own personal event planner. There you can customize everything from the print overlays, backdrops and everything else you can think of. Aside from the agreed upon time frame, you can rest easy knowing your guests won't be turned down after a certain amount of pictures have been taken. Lots of different props available for any occasion. Hats, Wigs, Signs, Glasses, and more. Go for a random pack or customize it for a special theme. You didn't think we would just drop it off and leave it did you? Of course not. We have a fully trained Booth Operator on hand to assist you and your guests if they have any problems, questions etc. Post event we will supply you with a thumb drive containing every picture taken throughout the evening. 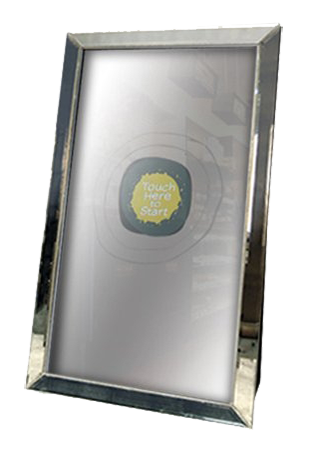 The Selfie Mirror Booth is a unique photo generating product offering the latest technology in interactive picture taking. The full-length mirror offers a functional design and a user-friendly interface, communicating with guests through a touchscreen of colorful animations and an entertaining voice guidance. Check out our demo video and/or contact us today for more information. Two Incredible Booths to Choose From​! Stand Up, Sit Down, Backdrop, No Backdrop... There are lots of options with the Convertible booth. Click here for more info. A one of a kind, show stopping, full size mirror photo booth! Click here for more info.